You might think that the Men in Black franchise is overdue for a sequel. Actually, it was rather nice that they made people forget for a while that this franchise ever existed. The last one (the part 2) was bombarded by negative critics as a mere remake of the first movie. This new movie felt fresh because you have not seen these heroes for, actually, a decade. 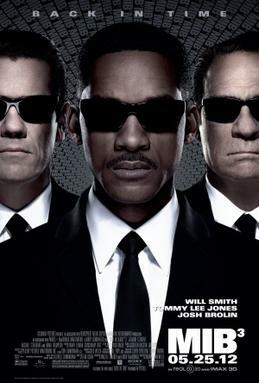 Although there are so many similarities to the previous movies, and yes, in a pessimistic way of seeing it, one can say that this has so many things that have been repeated from the previous MIB films (such as the progression of the action sequences, gadget gimmicks), the very core of its main plot is refreshingly a different one from part 1 and 2; it's a time travel movie, and we get to see Agent K in his younger version, played by Josh Brolin. When we talk about superhero movies, the finest ones that come to mind are the ones that have been taking the superhero concept seriously; the ones that have been open-minded enough to takes such concepts and use serious cinematic styles upon them. Movies like Spider-man 2, and the first two X-men movies have taken superheroes as real people, that is why they have been really great superhero adaptations. But I think cinema in general has already gone past the maturity and open-mindedness to take superheroes seriously. It is time to do way much better than just merely making superheroes realistic. Chris Nolan’s The Dark Knight has always been the best superhero movie. It succeeds not only in the sense of being a superhero movie, but succeeds in being one of the finest movies ever made in Hollywood cinema. The degree of Dark Knight is very much off the scales, that I cannot imagine if any movie can even stand equal to it. Not until The Avengers.